We can quickly rattle off books/films that tell of men's heroic feats. But of women? Not so fast. And what does the hero's journey of a woman (which is another way of saying — what do we need to do to really grow up, and happily) look like anyway? According to several Jungian psychologists, including Bolen, our journey looks a lot like the mythological Psyche's journey in which she takes on four overwhelmingly difficult tasks, not for adventure, but for a relationship. If, and when, she successfully completes these four tasks, she will be reunited with her husband Eros. The first task? Sort the seeds. Psyche must sort a huge jumble of corn, barley and poppy seeds into separate piles before the next morning. The task seems impossible – and is impossible – given her timeframe, until an army of ants comes to her aid, and helps her sort the seeds. In order to become the hero of our own story, we must sort the seeds of our possibilities in the face of conflicting feelings and competing loyalties. Where there are competing loyalties, there will be those who would dissuade us, potentially fueling the very fear we are trying to face down. However, the industrious collective of ants – our intuition – will help us gain courage and establish priorities, if we will let them. As an example of one loyalty, have you ever asked yourself — If I spend time pursuing my dream, instead of fully devoting myself to my husband, children, parents, neighborhood, etc., what will people think of me? Because thinking they will do, feedback they will provide, and quite possibly under the guise of a light-hearted joke. Maybe one that calls into question your femininity. If you were feminine, you would be focusing your attention on your husband's career, not on running a marathon, starting a business, learning to dance. If you were feminine you wouldn't neglect your children (they've had to eat top ramen all week, poor things) to pursue a dream. When we are questioned, how do we respond? Do we shut down our dream and go home? Or in the questioning, are naysayers actually helping us, rather than hindering, as they impel us to sift and sort even more? If someone discourages the pursuit of our dream, what could be their agenda? Does it have anything to do with you? Or is it about them? If I don't pursue my dream, will I eventually be resentful because I made it possible for my husband, children, etc to pursue their dreams, and now I feel that life has passed me by? When you are in the midst of competing loyalties, there's only one thing to do. 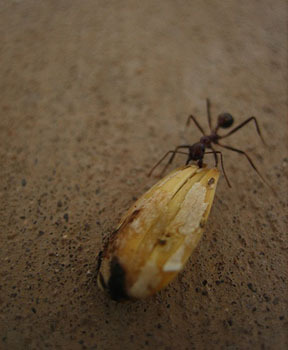 Call in reinforcements: your army of ants — your intuition. Because if in fact you want to be the hero of your story which requires that you attend to relationships AND pursue your dream, then you may need some help in figuring out how. Set it aside for an hour, a day, a week, a month. While the ants have a go at your pile of possibilities. Together you'll sort it out.